Mordaunt-Short has crafted an enviable reputation in the world of sub/sat speaker systems. Both its Premier and Genie packages have been universally well-received, but compared with the new Alumni, they now just seem lacking. Yet again, Mordaunt-Short raises the bar on small-box 5.1 sound - and if the company does it again, we're gonna need a bigger bar. This is both a £600 package and individually-available product: the Alumni 2 baby standmounters sell for £140, the Alumni 5 centre is priced at £120 and the Alumni 9 powered sub grunts in at £200. There is no dedicated side surround speaker, but an extra pair of Alumni 2 would serve to make a 7.1 configuration. The Alumni is a clever interweaving of previous Mordaunt-Short speaker technology. Not only are there recognisable bits of Premier and Genie in there, but a healthy dose of Avant and even Performance speaker DNA run through the Alumni's construction. Those white, 75mm continuous profile cone mid/bass drivers and 25mm aluminium dome tweeter featured in the Alumni 2 and 5 are used extensively across the Mordaunt-Short ranges. The curved-back glossy black or white cabinets seen here owe a lot to the up-market Performance 6 speaker, too. Both enclosures are designed to be compatible with Omnimount wall fixings or Mordaunt-Short's own 300P brackets, and the boat-backed speakers work well perfectly bang up against the wall (indeed, I conclude that they have been designed for boundary use, as moving the speakers into free space robs some of the bass performance and perhaps puts too much emphasis on the subwoofer). There's common ground between the main speakers and the centre channel. Both units have exactly the same measured performance; identical impedance plots, sensitivity and frequency response. Both main and centre speakers are rated at working between 100Hz-20kHz, although the amount of roll-off at the frequency extremes is not rated, and that extra driver in the Alumni 5 will give the speaker more authority at the bottom-end, even if it's not acknowledged in the on-paper specs. The subwoofer is perhaps the most traditional component in the package, lacking the remote control/measuring microphone system deployed in the bigger designs from the same brand. Nevertheless, it's still got all the usual raft of phase, level and frequency controls, and the combination of a modest 120W amp and a 200mm long-throw front-firing driver, with a small fist-sized down-firing port, make the sub a handy addition to the team. The port means there's no option but to use spikes to raise the sub off the floor, though. It is worth noting that these speakers are not the loudest around at any specific volume level. However, what they lack in efficiency (measured at just 6dB), they make up for in finesse. I'd say that the size of this package makes it ideal for typical UK-sized living rooms, and certainly the superior design aesthetics will win it plaudits from the most vocal speakerphiles. It does come with some design caveats though. Specifically, the subwoofer won't deliver the sort of visceral slugger-bass that some cinephiles demand, but back in the real world, the speakers blend together perfectly well. 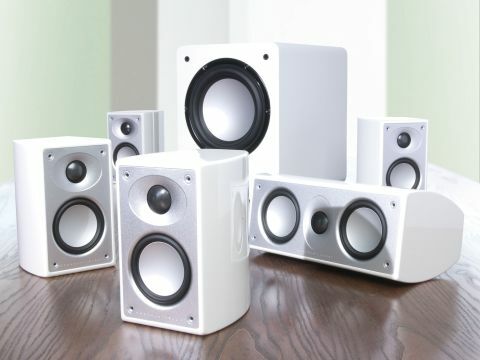 The performance is deceptive - do the hi-fi buff trick of closing your eyes while listening to the sounds and there's absolutely no-way you would guess these speakers aren't twice their physical size. They are also extremely difficult to locate in the room from an audio standing, and seem to have no problem articulating a seamless soundscape. Having pretty much exactly the same speaker as centre and satellites does give the integration of the system a lift. In fact, if you have a scene where the sound swirls around the viewer (pick any random maelstrom in X-Men, Spider-Man 3 or Fantastic Four - Rise of the Silver Surfer - it's a popular effect with reworked superhero comicbook flicks), the stability of the timbre from speaker to speaker is admirable - such smooth transition around the room makes these aural effects come to life. This integration between speakers is also backed up by the articulate centre channel. Going back to those maelstrom sequences, the Alumni system is even adept at still being able to make sense of dialogue, even though the sound is usually indistinct and swamped. On a more cerebral soundtrack, the diction is brought to the fore. Mid-bass is good, albeit depending on installation and room size. Driven with a beefy amp, sound can be taut and powerful, even if it's not capable of doing heavy earth moving works. If this pretty system has its limitation, it's a minor one. It's sold as a 2.1 and 5.1 channel package, and the 2.1 configuration perhaps best shows the Alumni system to be not the most dynamic sounding speakers around. Those who enjoy big and bold Beethoven, with huge romantic musical fireworks (like the last movement of Beethoven's Symphony No. 9, for example) are not advised to go for the Alumni. By the same token, this is not a rig that will be easy to optimise for Die Hard 4.0. But for those looking for an even-handed, articulate multispeaker package with a sense of style, the Alumni ticks all of the right boxes.